Ornamental oregano sounds like a mistake. Anyone who has ever grown Greek Oregano, or any other culinary oregano, will tell you it is pretty plain Jane. But, there are oreganos that are drop dead gorgeous. These include Dwarf Pink Saso Oregano, Dittany of Crete, Hopley's Purple, Kent Beauty Oregano, Marshall's Memory Oregano, Rosenkuppel Oregano and Showy Pink Oregano. Some of these like Dwarf Pink, Hopley's Purple, Rosenkuppel, Marshall's Memory and Showy Pink have flower heads similar to Greek Oregano except instead of plain white they are dunked in rich colors of pink and purple. Others like Dittany of Crete, and Kent Beauty have, not only the tiny colorful flowers, but also large colorful bracts that run from chartreuse to pink and are reminiscent of hops. All of these oregano flowers are excellent for drying. They bloom for a long time in summer and can be cut at will. The tiny individual flowers are delicate, so be gentle when you cut and bunch. They will remain with the bracts if treated tenderly. Cut enough flower stems to make a small bouquet and arrange it before you bundle it so it is attractive. Twist tie it near the flowers leaving the long stems below. It only takes a day or two of hanging upside down to dry. If the flowers are grouped very tightly so they support each other, they can be stuck in a dry vase to dry. By leaving the stems long, arrangements can be made later and stems trimmed to fit the need. Use sharp shears or the blooms will fall. 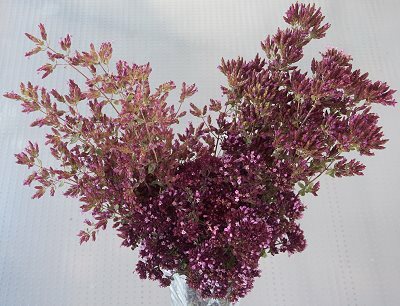 Large arrangements can be made in the field with other flowers like Baby's Breath, Statice and Powis Castle Artemisa. Dwarf Pink, Hopley's Purple, Kent Beauty and Showy Pink are hardy to about Zone 5, while Dittany of Crete is hardy from about zone 8. All of these oreganos die back to the ground in most areas over winter. They emerge fresh each spring and usually flower in the summer. After flowering, it is important to cut them back to the ground. Like all Oreganos, these plants like full sun and good drainage. Good drainage is especially important in areas with heavy winter rains. They all do well in containers. Ornamental oreganos have no taste, although Dittany has been used for medicinal purposes. It is odd that their beauty denies them flavor while flavor denies culinary oreganos beauty. Ornamental Oreganos make a great addition to our Crafter's Herb Garden Six Pack.